Something to read and learn from at the Waverly Jewish Cemetery. Back on the bike after many days of rain, I was glad on Thursday to come across a helpful addition to the Waverly Jewish Cemetery. Helpful? Yes, it’s an informational kiosk that tells visitors like me more than we knew before about the history of the town. For instance, I learned that this cemetery, in the 3100 block of Salem Avenue, was established as a Jewish burial ground in 1877 and deeded to the First Hebrew Congregation of Albany the following year. Now the place occupies two acres of the 10-acre Waverly Memorial Park owned by Masonic Lodge 17. 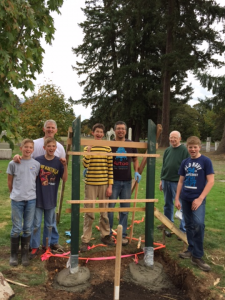 The Masons assumed responsibility for the cemetery in 1924, and the Jewish section is administered by the Willamette Valley Jewish Community Burial Society. The kiosk has a lot more information, and for additional details it refers readers to a website, AlbanyHebrewCemetery.org, which includes a way to contact the keepers of the website. 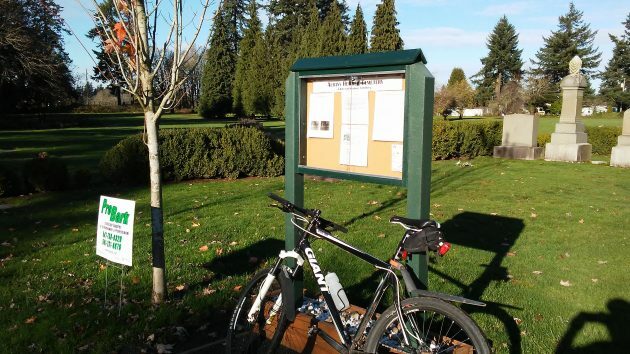 This kiosk, I learned from reading what’s posted there, was the work of young Nathan Vega, who planned it as his Eagle Scout project and built it over a few days in October with the help of eight volunteers. Nathan Vega and some of his helpers, as shown on AlbanyHebrewCemetery.org. The kiosk has useful advice on taking rubbings off grave markers: DON’T, it says, because the practice can do a lot of harm. Take pictures instead. The graves tell part of the story of Albany’s early years, and how newcomers to America helped build the town and enrich its culture. On an earlier visit, I checked on the grave of Josef and Anna Bikman, immigrants from Tsarist Russia who founded a prominent Oregon family. I also noted the marker of another immigrant, Aaron Senders, who died in 1896 and whose family name has been part of the Albany business scene until the present time. 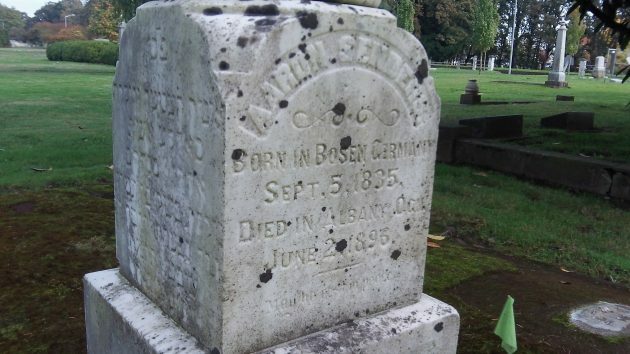 His gravestone says Aaron was born in Germany in 1835. I looked up the name of the town. Bosen is a village in the southwestern German state of Saarland. On Google’s satellite view, it looks like it can’t have more than a few hundred inhabitants, although the regional government there in the 1970s built a dam and a big reservoir that has turned the place into a draw for vacationers. Hasso, this may be one of the best stories you’ve ever done. Touching, linking a young person of today who had a vision to honor those of the past. A lot of history can be found in cemeteries across the land. I encourage people to get involved in findagrave.com and help link their ancestors together.